November is fast approaching and the regional workshop in Malawi, dedicated to AGRIS* and AGORA** is getting closer! Malawi is among twelve target countries participating in a new Research4Life programme: DAR (Digital Access to Research)***, with Burkina Faso, Liberia, Mozambique, Rwanda, Senegal, UR Tanzania, Uganda and others. This is the first AGRIS & AGORA capacity development event which included DAR. The aim of the workshop is to discuss how to enhance the accessibility and visibility of scientific publications in sub-Saharan Africa, in particular with the usage of AGRIS and AGORA programmes/services. knowledge sharing in particular and interdisciplinary contexts worldwide. The final goal of the workshop is to strengthen the AGRIS and AGORA communities of practice in Africa and to set priorities for the next few years based on facts, usability and outreach of AGRIS and AGORA projects. * AGRIS is a multilingual bibliographic database and your link to worldwide agricultural information, presented by journal articles, monographs, book chapters, and grey literature - including unpublished science and technical reports, theses, dissertations and conference papers. * Since 1975, AGRIS has been serving users from developed and developing countries through facilitating access to agricultural research (including nutrition, food security, forestry, fisheries, rural development, biology, food systems, livestock production, natural resources and related topics). * AGRIS records are indexed by AGROVOC keywords presented by URIs. AGROVOC is a multilingual vocabulary composed of 35,800+ concepts in up to 29 languages, aligned with 18 other multilingual knowledge organization systems related to agriculture. * AGRIS is maintained by the Food and Agriculture Organization (FAO) of the United Nations. Every month, AGRIS is accessed by more than 600,000 agricultural and research professionals worldwide, from more than 200 countries and territories! 82% of the users are students, researchers and librarians. The October 2018 AGRIS linked open data set release comprises 9,549,442 records; about 2 million of AGRIS records provide access to full text resources! In 2018, - 133,337 AGRIS records came from Africa. ** AGORA is one of the five programmes making up Research4Life. The other four Research4Life programmes are Hinari, OARE, GOALI and ARDI, covering research in health, environment, law, development and innovation. 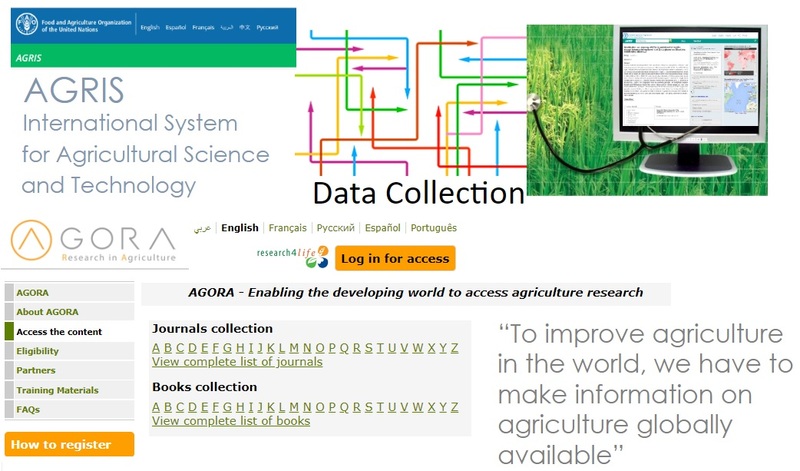 The AGORA content portal provides free or low cost access of up to 13,700 peer-reviewed journals and 26,500 e- books (in agriculture and related sciences) to more than 3,400 institutions from more than 115 eligible countries, as of October 2018. AGORA content is indexed by 46 AGROVOC subject keywords. AGORA continues to improve the quality and effectiveness of agricultural research, education and training in low- and middle-income countries. The workshop will discuss how AGRIS, AGORA/Research4Life could better enhance accessibility to external sources and visibility of scientific publications in institutions based in Africa. Considering a strong interest in using AGRIS, AGORA and Research4Life search services, different strategies will be discussed on how to increase participation in and contribution to these programmes by tailoring outreach and training to meet and strengthen education and research objectives and needs of all interested parties. The workshop participants will learn about key trends in scientific publishing in agriculture and related sectors and understand different searching and participation mechanisms in AGRIS and AGORA. Feedback received from previous AGORA workshops held in 2018 was overwhelmingly positive and clearly shows the high level of effort and commitment put forth from our meeting participants and organizers. We are excited to facilitate this meeting, to raise awareness and foster capacity development activities, and to make agriculture and nutrition data more available, accessible and usable in Africa and worldwide. *** The United Nations Technology Bank for the Least Developed Countries (LDS) & Digital Access to Research (DAR): The Technology Bank for the LDCs is an organ of the UNGA. The Technology Bank through DAR joins the Research4Life partnership as a new type of programme, focusing on the particular needs of the LDCs. The Technology Bank will build on what Research4 Life (R4L) has already accomplished regarding online access to the world’s high quality published scientific and technical information. AGRIS & AGORA STAND FOR: "EVERYBODY’S CONTRIBUTION, EVERYBODY’S KNOWLEDGE"